Architecture critic Philip Jodidio says that “the most interesting buildings of today are, almost without exception, respectful of the environment, sustainable and designed to consume the least energy possible.” In the book 100 Contemporary Sustainable Buildings (publisher Taschen) Jodidio has collected the best examples of this architectural trend toward green, forced by the seriousness of climate change. Here are 10 examples of this architecture concerned about nature, which in some cases provides the latest technologies and in others turns to solutions as ancient and simple as maximizing the use of sunlight. 1. Selgascano Studio. Architects: José Selgas and Lucía Cano, Madrid (Spain) 2007. 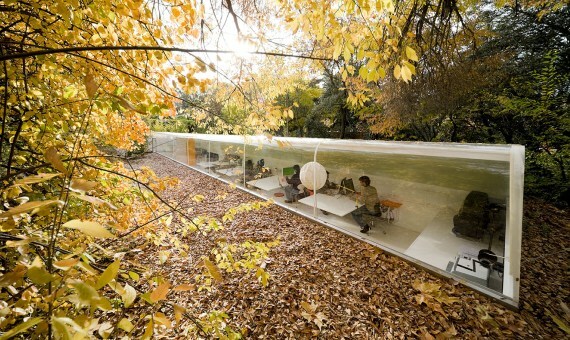 The intention of the architects for the studio was simple: “to work under the trees.” They placed a transparent part towards the north to avoid direct sunlight on the work tables and covered it with a curved transparent plexiglass plate. The architects note in an article in the specialized journal ARQ, “the unusual association of several catalog items” such as the curved plastic membrane, are taken from a list of components of a train car. 2. Chesa Futura. 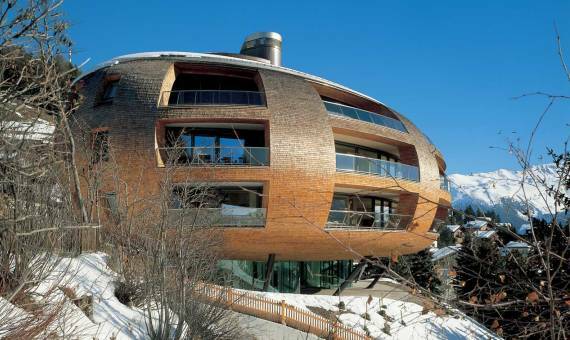 Architect: Norman Foster, Sankt Moritz (Switzerland) 2004. “Chesa Futura” in the Swiss Romansh language means “house of the future”, and that is what purports to be by merging the latest technology with traditional construction techniques of the region, Sankt Moritz, in the Swiss mountains. 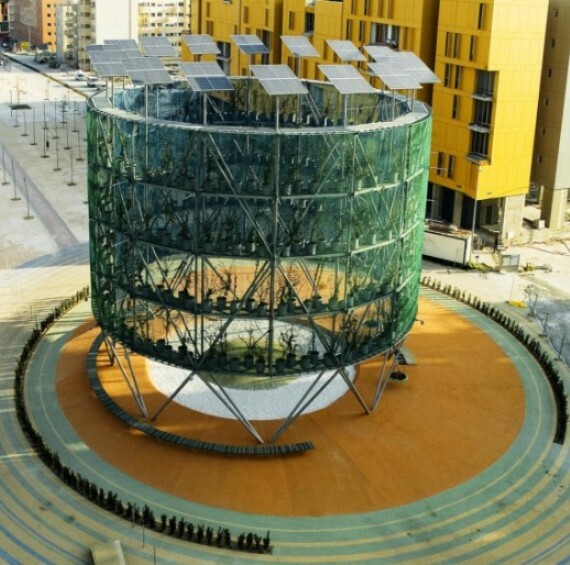 The Chesa Futura is a three storey apartment building in the shape of a bubble. Its exterior is made of a local wood, larch, that will last a century without maintenance, according to the architect, the famous Norman Foster. The south facade is open to allow light to enter, while to the north it is closed to save energy. Japanese architect Shigeru Ban was awarded the 2014 Pritzker Prize, considered the Nobel of architecture, for his “elegant and innovative projects for private clients” and for employing this same innovative design “for his extensive humanitarian efforts.” The Papertainer Museum in Seoul is an example of this innovation, combined with very simple materials. The building, a temporary installation, was created to celebrate the 30th anniversary of the Korean publisher Design House and its shape is, precisely, that of a D. It is built with 166 cargo containers and 355 paper tubes about 10 metres high. Its simplicity allows it to be quickly disassembled and transported to other cities. The young architects of the Urban Ecosystem studio conceived of three “air trees” to try to boost the social life of a new urban extension of Madrid. 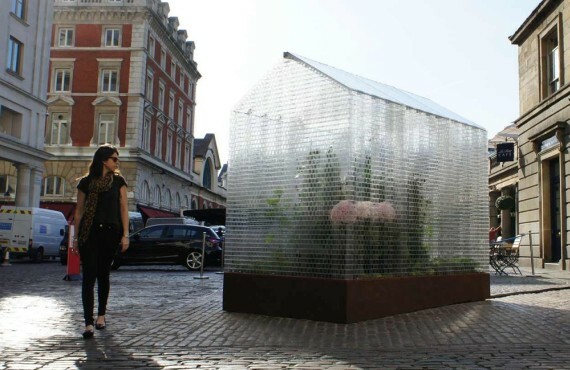 The structures, made from recycled materials and plants, mimic greenhouse systems for lowering the temperature by up to 10 degrees. They are also “exportable, so they can be reinstalled in similar locations or other places that require a reactivation of their activities.” Since their implementation, they have become a gathering place for neighbours. 5. CaixaForum Vertical Garden. Creator: Patrick Blanc, Madrid (Spain) 2008. 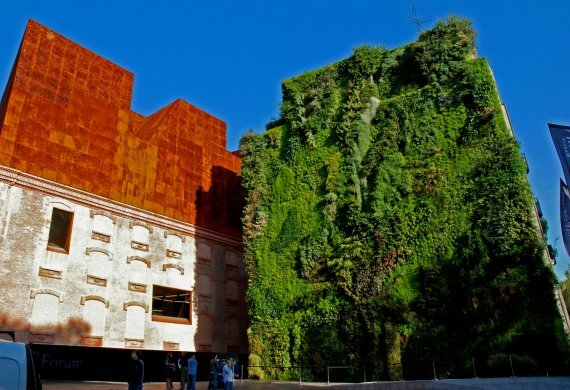 The CaixaForum cultural center is located in the Paseo del Prado of Madrid, near the renowned Prado, Reina Sofia and Thyssen-Bornemisza museums. 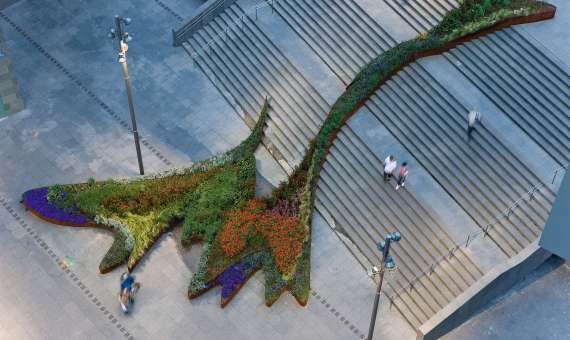 To provide a space in the avenue, landscaper Patrick Blanc created a 24 meter high vertical garden, with 15,000 plants of 250 different species spread over 460 square metres. The green wall, without earth, survives on water and nutrients. This spectacular vertical garden completes the rehabilitation of a former coal power station designed in 1899, of which the original modernist industrial facade is preserved. 6. The garden that climbs the stairs. Architect: Balmori Associates, Bilbao (Spain) 2009. 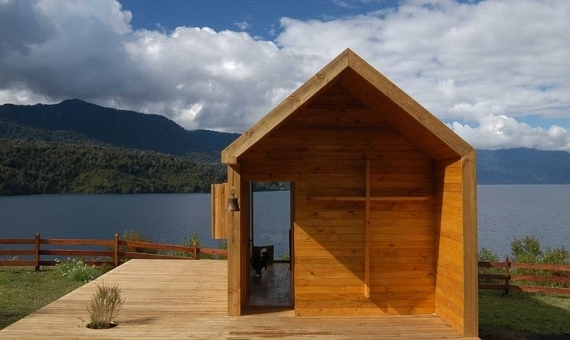 In a sloping plot on the shore of Lake Rupanco, the architects designed a small chapel of just 20 square metres, built with low cost materials and for easy installation. According to one of the designers, Alejandro Dumay, the volume is conceived “as a whole, without making distinctions of its structural elements.” Walls, ceilings and openings form a whole, thanks to a pinewood covering. Inside, the altar image is formed by the landscape itself: Lake Rupanco and the beautiful mountains. 8. Lego Greenhouse. Architect: Sebastian Bergne, (London) 2011. In September 2011, visitors to London’s Covent Garden market were able to see a greenhouse built with 100,000 pieces of Lego. 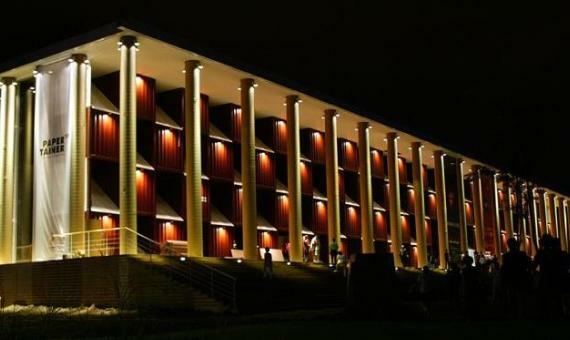 Its creator, architect Sebastian Bergne, installed it with a sloping roof in reference to the architecture of the neighborhood, while the interior plants referred to the market’s past as a business centre for the garden industry. For Bergne, the greenhouse shows the potential of using toy parts in the actual construction sector. 9. The Barony House. 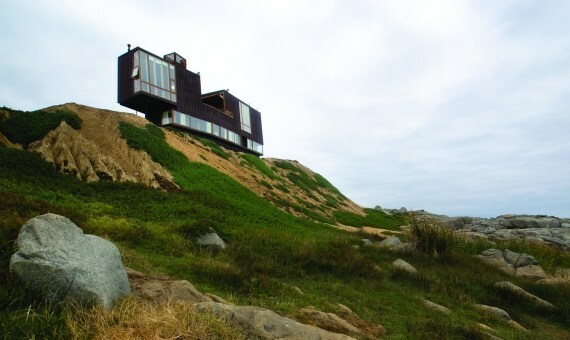 Architects: DRN Architects, Quintero (Chile) 2009. The creators of The Barony House on the Chilean Pacific coast had to abandon the plan to create an idyllic home due to the extreme humidity and salt air. To address these constraints, they opted for an exterior dominated by glass and weathering steel, sheathed in the interior by warm wood. The building, designed as an austere family retreat, offers an incredible view of the sea through a window in the bedroom on the ground floor, while upstairs it is shaped in order to fit a balcony that juts out over the ocean. 10. BIP Computers. 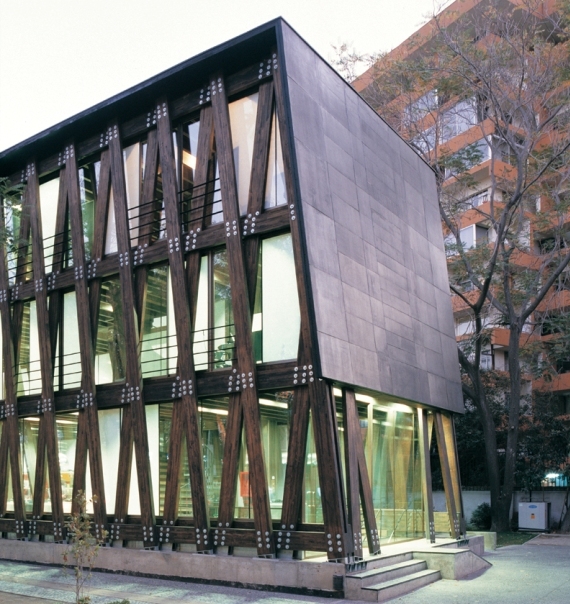 Architect: Alberto Mozo, Providencia (Chile) 2007. This office building of three stories, built of wood, reuses two existing houses from 1939 and also allows for the disassembly of the group and its reassembly elsewhere. In this way the architect, Alberto Mozo, solved a request by his client concerned about a possible bid to build a twelve-storey tower on the site in the future. As the designer explains, the building uses thermal insulation to reduce heat loss through the glass in winter and employs only pinewood from renewable forests. What's Going on in the Robotics Laboratories of Top Universities?